I am trying to do a non-case-sensitive check on two strings that may or may not have spaces in them. I have googled this and there is quite a lot of literature on either of these problems, but I can't seem to find much on doing both at once and I would ideally like a tex or latex solution that doesn't require external packages to be loaded (but this isn't required). I have something that seems like it should work using packages, and yet I can't determine why it doesn't. Here is the MWE. 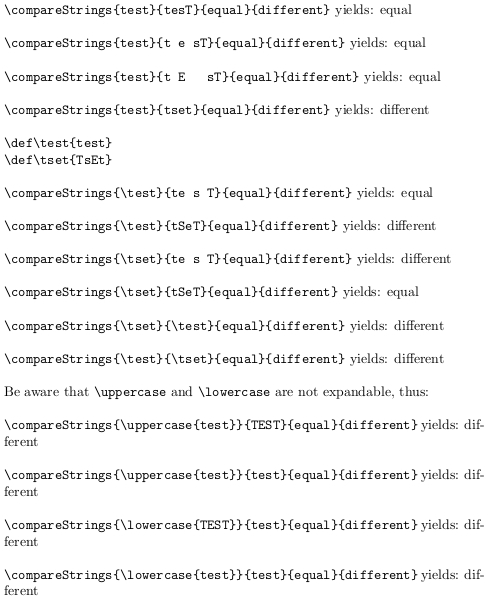 When you compile it, the \tempA and \tempB both display the exact same string, but the comparison itself returns False (the 3rd and 4th parameters in \compareStrings are suppose to be the true and false conditions, but I replaced them with words for testing purposes). Any suggestions or explanations as to why it appears that the two strings are the same but aren't yielding "True" would be much appreciated. My first thought was that expansion would be to blame, but I would have expected edef to solve this problem, and clearly it is not. 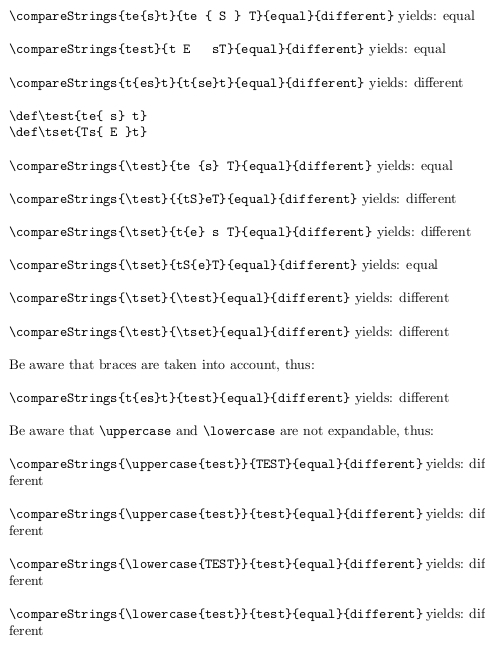 You need to apply lowercase to the strings before you compare, so it needs to be outside any \edef here I have used \pdfstrcmp to avoid having to define additional temp macros, this primitive is also available in other engines than pdftex, as \strcmp. Be aware that \lowercase neither is expandable nor does trigger expansion of its argument. Be aware that \zap@space does not trigger expansion of its argument. Thus you need to ensure that those tokens that expand to characters where spaces shall be removed are already fully expanded when \zap@space comes to action. % /does not get carried out at "e-def-fing-time". % instances is already expanded due to the previous \protected@edef. In case the removal of space tokens needs to be applied in situations where the argument itself may contain braces, I can offer an expandable routine \UD@removeallspace for recursively removing all explicit space tokens from a token sequence even when the argument contains braces, without the need of sentinel-tokens that may not occur within the argument. As a side-effect the routine does replace pairs of matching explicit character tokens of category code 1/2 by matching braces. Usually braces are the only characters with catcode 1/2, thus usually this should not be a problem. Usually. %% End of code for expandable recursive space-remove-routine. Not the answer you're looking for? Browse other questions tagged macros conditionals expansion strings or ask your own question.